Danny, aka Kid's Money, is a 7-year-old fawn male, born October 1, 1995. Danny participated in over 134 races from May 1997 to August 1999, racing in Florida and Texas. 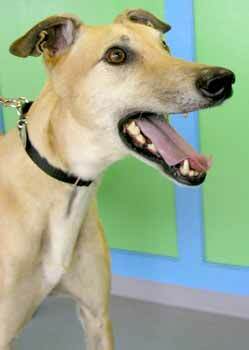 Danny has been in a home for almost 3 years, and is now looking for his REAL forever home. He is a wonderful boy and will make an excellent companion. Danny is small dog tolerant but it has not been determined at this time if he is cat tolerant. 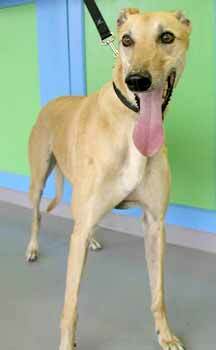 Danny is a big, happy, beautiful boy with the most soulful and expressive eyes, who loves everyone and everything. His tail is in constant wagging motion, and he loves to slip little nose kisses in while he's sniffing faces. Danny is drawn to kids and little dogs and is gentle with both. He enjoys looking at himself in mirrors, playing with stuffies and with my 4 dogs, exploring the back yard, and of course, napping. Danny is a champion leaner and will do anything for an ear scritch or a throat rub. He has lots of "tickle spots" and gets so carried away during the tickling that he almost swoons. He has no desire to get up on the furniture, but does love dog beds. His racing history is lengthy, so he was quite a good runner. He will be some lucky somebody's best buddy for life.